When storing your hunting gear, it's important that you put the same effort into proper storage as you do during trip preparation. For most of us, another big game hunting season has come and gone. If your house is anything like mine, you have hunting gear strewn about the garage, your vehicle, the laundry room, and maybe even your bedroom or living room. Hunting gear is expensive, so it's important to keep it in great working condition so that you can get the most out of your investment. Now is the time to gather it up, organize it, take inventory, wash it and pack it away. These quick tips for properly storing your hunting gear in the off season will set-up you up for success when opening day rolls back around. This seems like a no-brainer, but if you don't already have a designated space in your home to store your hunting gear, now is the time to make one. While the garage, attic or an outdoor storage shed might seem the most logical, extreme temperatures and humidity can be killer for your equipment. The seams of your boots can come unglued and the reeds in your hunting calls can warp. 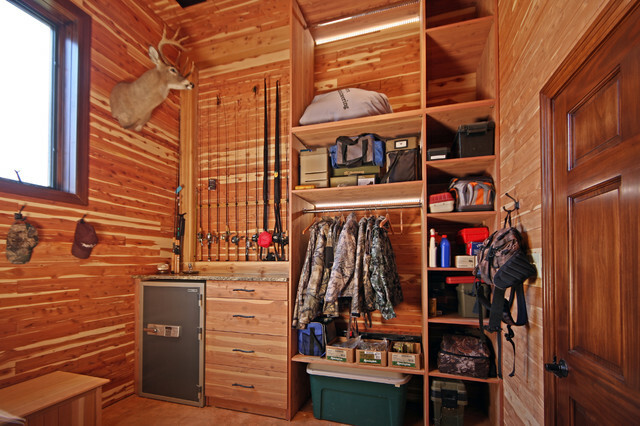 You need climate-controlled storage when storing your hunting gear. Take over a spare closet inside your house or consider renting a climate-controlled self-storage unit. As you gather up your gear, check for tears, fade, and normal wear. Don't just check your clothing. Pay close attention to harnesses and treestands to make sure they function safely. If you need to replace anything, you can take advantage of end-of-season markdowns at most retailers. Don't wait until next season and get stuck paying full price. Washing your clothing with baking soda or scent-eliminating detergent is useless if you washed your regular clothes beforehand using aromatic scented detergent. Run a cycle using washing machine cleaner, then run a load of just clean water. Turning your hunting clothes inside out before washing them will help reduce fading. If possible, skip using your dryer all together and opt for a clothesline instead. Unfortunately, I live in a neighborhood with a homeowner's association that restricts the use of clotheslines. As you should before any load, clean your dryer's lint trap and invest in some scent elimination dryer sheets. My personal favorite are the Dead Down Wind Dryer Sheets. I have a type-A personality that likes to keep things organize. Instead of scent-free bags, I prefer large plastic storage containers. In my house, we buy containers with two different colored lids for his and hers, so we can quickly and easily find our own gear. We also keep our accessories in these containers like our packs, gloves, hats, and even our boots. Before we put the lid on, we throw dryers sheets or scent wafers inside. Cedar chips or pine, juniper or sagebrush clippings are other alternatives. For any electronics that you won't use until next season, like flashlights, radios, GPS or maybe even game cameras, remove the batteries. This will prevent them from spoiling and corrosion in the battery compartment. Latex diaphragm and tube calls retain moisture from your mouth and can be breeding grounds for all kinds of bacteria. Bacteria will cause them to breakdown faster. Do yourself a favor, rinse them with cool water and allow them to air dry completely before storing them. Even if you cleaned your guns between hunts, it's always a smart idea to go over all your firearms before storing them for the off-season. Break down all working parts including the barrels. Use a light amount of solvent in the bore of the rifle or shotgun to remove any residue, and run the brush and subsequent patches from breach to muzzle. Store your guns barrel-up to prevent warping. Hunting boots get used and abused, and as with any other hunting gear, moisture is the enemy. Rid your boots of odor, moisture and bacteria by tossing your insoles at the end of the season. While you're at it, go ahead and replace them with a fresh pair. Take a few extra minutes to implement these tips to prolong the life of your hunting gear. It will also give you a jump on your pre-season prepping. When fall rolls around and your hunting buddies are scrambling to get ready, you'll be glad you did.